Yes you read it right at the top of the page – Floyd Mayweather in the UFC is a real thing being discussed at an accelerating rate in various circles behind the fight game. It doesn’t matter how you feel about Floyd fighting in the UFC really, because the pay-per-view buys alone that him fighting in the UFC would generate, is enough for the UFC owners to be fully on board with trying to make Mr Mayweather in the UFC a reality. Ever since Floyd beat Conor in a Boxing match back in August 2017 MMA and Boxing fans have been wondering – I wonder how Floyd would do in MMA? Well one thing is for sure If you have a winning mentality and physical/technical talent you will likely build a winning record in MMA – when it comes to a winning mentality Floyd Mayweather probably has that more then most fighters do, which considering he has a 50-0 boxing record against some of the best is fully understandable. Yes he will have to spend a lot of time developing his Muay Thai, Jiu-Jitsu and Wrestling – given the fact that he is 40 he may struggle with integrating new skills in time to be any more then a pure Boxer in MMA. Lastly physically can he do it? I would say yes – the man just nearly did 12 rounds with someone much younger then him and didn’t look out of breathe for a moment in the fight – so physically Floyd is in great shape, but after a few rounds of hard grappling against the cage who knows how his cardio will hold up. Who will he be fighting? Well he will NOT be fighting Conor McGregor in MMA, well nobody can say that with certainty, but realistically I don’t think it would be a good idea for Floyd to have his first MMA fight against a two time UFC champion like Conor. I’m sure Conor would love to beat Floyd Mayweather up in a UFC cage, especially after what Floyd did to him in their Boxing match, but in all honesty I feel like Conor would just pick Floyd apart with a strong kicking game, while mixing in some grappling which I think would all overwhelm Floyd. If Floyd has a successful MMA debut, then maybe him vs Conor in MMA down the line will be possible – personally I don’t think Floyds MMA debut should be in the UFC, but because of the size of his name and his Boxing accolades then its perfectly understandable. But who could he fight first? Well it has to be someone he has a chance to beat in MMA, someone inexperienced in MMA like Floyd with some kind of name value to help with ticket sales…..I hate to say it, but someone like CM Punk could be a perfect fit for Floyd’s first UFC fight. He has a lack of experience in MMA and has some name value so we will see – some other names may become more apparent as we get closer to a deal being struck, but we will keep you up to date right here at the MMAGateway. So when will this be happening? But given the fact that the Floyd vs Conor boxing match took a good year or so of gossip before a fight date was booked – it may be a year from now before we see Floyd actually stepping in the octagon – could be longer, could be quicker. But because Floyd is already 40 then he may want to speed up his debut – so who knows we may see Floyd fighting in MMA before the end of 2018! One things for sure – a Christmas/New year card with Floyd headlining, or being in the co-main against anyone will be huge for the sport of MMA. Rest assured that you will get all the news about Floyds debut in the UFC as soon as it comes up, but personally I can’t wait to see him in the iconic UFC octagon – he has said that he is only interested in making big money many times, so Floyd is never going to sell himself short. He may end up just doing a few feature bouts to make some big paydays, but at the same time given the ans competitive nature, if his debut goes really well, then he may be interested in trying to put together a title run at the 135-155 weight range. The multiple time Boxing world champion Floyd Mayweather, becoming a UFC champion would pretty much be bigger news then anything the sport of MMA could produce right now without question. In 2018 in MMA, especially in the UFC with the owners they have, its always good to remember that anything goes really – making money is the main thing the owners care about mainly. 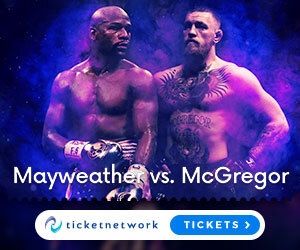 I don;t want to lose the legitimacy of the sport by turning it into a celebrity circus, but every now and then I am happy to have some big celebrity fights with great fighters like Floyd Mayweather crossing over into MMA. Nowadays the UFC is starting to like mixing MMA with entertainment a bit more, so we will have to get used to unique situations like this occurring more often in the future and as long as we don’t get whole fight cards of “Celebrity A vs Celebrity B” then I don’t mind . Its actually pretty cool to get a change up of some fight booking structures, mixing in some celebrity fighters, because it does make for great TV. As I have said though we will always keep you up to date with all the latest information on Floyd Mayweather in the UFC and any similar celebrity crossover fights. That’s all for today folks, so as usual please leave a comment below, like, share, subscribe as that all helps the website a ton and stay tuned for more from the world of MMA right here at the MMAGateway. I think MMA would get a huge boost in viewership (and new fans) if Floyd made a name for himself in the cage. If he can’t handle it though…he is 40, it might actually do more damage than good. I could see a lot of boxing fans getting turned off by MMA if Floyd doesn’t do well. Seems like there would be a big spike in viewers followed by a quick drop. Can the addition of Floyd (and maybe some A list celebs) bring sustained growth to MMA? Or do you think it is more of a short lived publicity stunt? Hi buddy, yeah I agree with some of your perspective here – MMA will definitely get a big boost in viewership if Floyd crosses over to the UFC – yeah he could get damaged in some fights, but his bank balance will also stay pumped up. I think MMA is growing in general regardless of if Floyd wins or loses, but yeah if he lost it could hurt the Boxing fan bases interest in MMA. Martial arts is no publicity stunt, it is eternal – but making money in entertainment sometimes needs little publicity stunts to sell tickets and make big jumps to the growth factor of MMA. I go into more detail about his point in this post. Also do you have any children who enjoy training? Well have a look at these! See you around my friend. Floyd Mayweather in the UFC will be a pointless endeavor. The man has plenty of money and if he isn’t gonna fight someone like Mcgregor who cares. The fact you even mention CM Punk was only good for a laugh and not something I would pay to watch happen. At the age of 40, all he is gonna do is punch. I cannot see him winning by submissions or doing much else but running around the ring anyways. You might be right, but i would pay to see Floyd fight anyone in MMA really, I do agree there’s better options then Punk, but it really would sell a shitload of tickets if Floyd decided to step into the UFC. Of course he wont win by submission and at his age he doesn’t have much time to learn new skills for MMA, but his athleticism and will to win is huge, so he may pick up some new tricks to add to his insane Boxing skills. Oh yeah by the way have you seen these Gloves before? Some of my favourites. These ones are solid too. Thanks for dropping in bro! With all the glory he already had in boxing why will he want to go down that road? I don’t think he can go there as far as a champion. He is a great boxer and has made history, however, I don’t see him reigning there as he did in Boxing. It is good for entertainment but for the sport, I’m not sure. Very interest post though, You open a great can for discussion and opinions. Yeah everything is still up in the air, but it really is an interesting topic – I think your right though, I don’t think Floyd Mayweather could be a champion in the UFC at his age, but his Boxing pedigree is the best of the best so it would be entertaining to see him try MMA, but yeah its certainly not a developmental fight for the sport. By the way have you heard of Darren Till before? Now that’s a guy who really is a future star of MMA. I am not sure if he will even be competitive in UFC. Boxing is such a small part of the MMS fighting style. I have a hard time seeing him beat anyone. For the same reasons I knew McGregor had no shot in the boxing match the same goes for the reverse situation. Yeah I know what you mean Tony, I’m not sure Floyd would e competitive in MMA either, but I would definitely pay to see it! Also have you seen this treadmill before? its perfect if your looking for new training equipment for your home!